Even by defining such a narrow list of positions, there is doubtless still a very large variety in the role played by this position. In previous reviews I have re-grouped players by my own considerations, eg. by grouping wingers with attacking forwards or defensive midfielders with certain central midfielders. 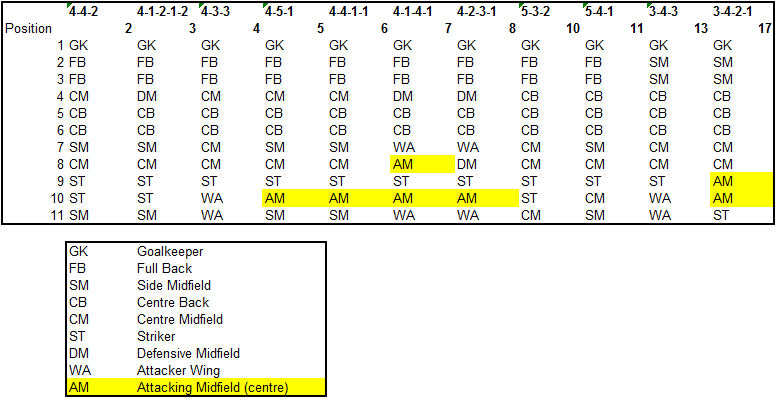 In this case I haven’t, because the number of teams using this position was relatively small – and in many cases there would be overlap between central midfielders and attacking forwards on the outside of a front 3. Although attacking fields already dominated those analyses this will give a different view of the players who qualified with even more bias towards attacking qualities. So, this time, I increased the playing limit to include the top 20 players by playing time. As I will comment later, narrowing the list can enable a slightly different perspective on a team’s tactics and even perhaps transfer strategy. The pool of players was relatively small, and included a range of player types – from Sergio Agüero (who often played just behind the central striker in a 4-4-1-1 last season) to David Edwards (who more likely played in flat midfield 5). The winner was the incredibly prolific Rafael van der Vaart who led the way in chances created (including through balls) per minute played. He combined an excellent ratio of goals from open play to shots on target from inside the box with a strong ratio of 3:1 shots in the box on target to shots off target. This was the key to his placing almost 10pts ahead of Gylfi Sigurdsson in second place, whose ratio of shots on target in the box was 1:1. By finishing ahead of Agüero, Hoilett’s statistics also show why he was so highly rated last season. 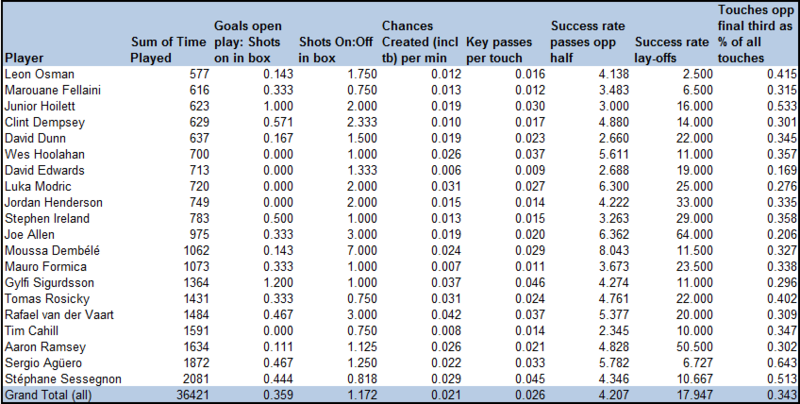 At the other end of the table are rather indifferent statistics from Everton’s 3 players in the table: Cahill, Fellaini and Osman. Having been so prolific in previous seasons, from this position Cahill didn’t manage to score in open play despite 21 shots inside the box and neither did he fare much better in chances created. Cahill’s decline in form probably helped to encourage David Moyes to re-sign the influential Steven Pienaar in January. Furthermore, since Cahill’s departure over the summer the resurgence of Fellaini as an advanced player coupled with additional support from Mirallas has clearly bolstered Everton’s attack, helping them to 2nd place in the league after 6 games. Spurs also had significant summer transfer activity involving 5 players in this list, with van der Vaart and Modric replaced by Sigurdsson, Dembele and Dempsey. Although it’s a crude comparison at best, VDV and Modric had an average pts score in this position of 58.8 vs 55.1 for their replacements indicating a possible weakening in terms of ability – but a strengthening in terms of total squad quality. In leaving Swansea, Sigurdsson has had a relatively quiet start to life at Spurs whilst his replacement, Michu, had an immediate impact. In 5th place on the list, Joe Allen reflects versatility perhaps justifying his cost to Liverpool as he has already finished in the top 5 of my DM position rating. Arsenal’s entrants Rosicky and Ramsey finished 10th and 11th. Wenger would surely hope for a more significant goals contribution from these two (each scored 1 from this position in open play) – however this was compensated for by a reliance on the goals of van Persie and Arteta’s aptitude for joining the central attack from a deeper lying position. In any case, Wenger will hope that the return of Wilshere and Diaby, plus the attacking signings of Cazorla, Podolski and Giroud should soften the impact of the losses of van Persie and Song. This entry was posted in Football Analysis, Sport and tagged Analysis, centre midfield, everton, Football, MCFCAnalytics, Opta, performance statistics, Premier League, soccer, spurs, tim cahill, van der vaart on October 3, 2012 by thepowerofeleven.